Surveying the vast rice fields of Markham Valley, Sunrice and Trukai Industries board directors have seen first-hand Trukai’s vital role in supporting a viable commercial rice industry in Papua New Guinea. 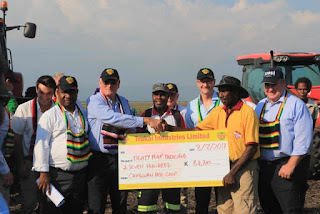 Members of both Sunrice and Trukai Industries board of directors travelled to witness the progress of Trukai Industries’ expansive Markham Valley rice project, established with the cooperation of the Chingwam Rice Growers Cooperative. The board was met by members of the Chingwam Co-operative on the new development site near Rangiampum Village. During the historic tour, a cheque for K84,700 for the purchase of the 140 ton of rice harvested in May was presented to the Chingwam Rice Growers Co-operative by Trukai Industries. Trukai’s ever-evolving partnership with the local farming community is evident. The results of Trukai providing local farmers with intensive training in commercial rice production methodology, and most importantly the finished rice product set for households around the country, were all on display. Rob Gordon, CEO Sunrice & Trukai Director, with Sunrice Chairman Laurie Arthur and several directors from both Sunrice and Trukai were warmly met by Michael Maran, Chairman of Chingwam Rice Growers Cooperative and John Maran, the Cooperative’s Project Coordinator. Other members and leaders of the Rangiampum community and Chingwam Rice Growers Cooperative were present along with Bernard Maladina of Niugini Strategic Services, as Trukai Rice Development Manager Humphrey Saese and Trukai GM-Agriculture Jarrod Pirie delved into the intricacies of their stunningly successful project. The occasion presented a prime opportunity for all stakeholders to reflect on the significance of the land development project’s progress over the previous 2 years - and get an indication of what is involved in the project expansion for this year and the potential for further expansion into the future. “This a significant milestone in the development of our rice industry in Papua New Guinea. The project has progressed from a ‘pilot testing’ to a whole new level in rice farming in the country,” said Mr. Saese. “This project involved an initial pilot testing of 10 hectares in 2015 and saw the successful cropping and delivery of 20 tons of rice. Trukai is currently expanding to a 500-plus hectare rice plantation near Rangiampum and the site will be progressively expanded up to 2,000 hectares over a number of seasons, subject to relevant agreements and climatic and soil evaluations. As Rice Development Manager for Trukai, Mr. Saese is now reaping the rewards of 15 years of dedicated planning and labour in Markham Valley. “I have worked for over 15 years in the Markham Valley in Papua New Guinea on promoting and encouraging farmers to grow rice. There has never been a moment like today when are able see farmers get the support in growing rice but more importantly actual Kina being paid,” he said. First photo – Mark Robertson (Trukai Chairman) presents payment to Michael Maran (Chingwam Cooperative Chairman).